I’ve just dug up the last of the broad bean plants. It’s something I’ve been putting off – they get chopped up and added to the compost bin which is a bit hard on the (injured but recovering) hands – but it is done now, and that’s it until late spring next year. Sigh. Broad beans are normally my first serious crop, my first seasonal treat (and usually my first brush with excess). When you grow a lot of your own veg, seasonality – inevitably – plays an enormous part: and that’s an enormous part of my enjoyment in growing vegetables. 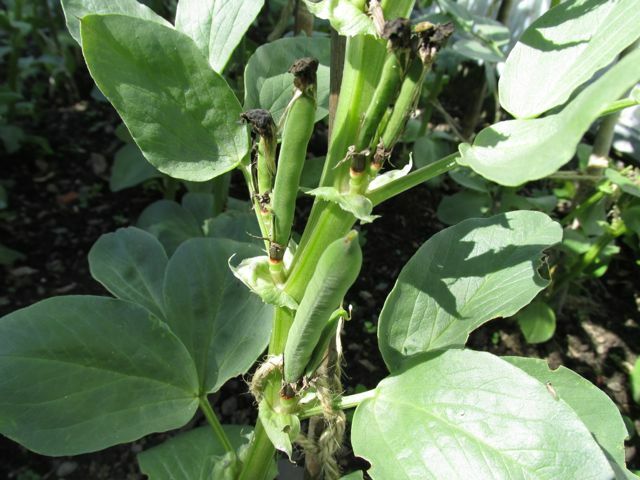 I find I really look forward to the first baby broad beans, the slim courgettes, the crunchy mangetout, in a way I wouldn’t if I went down to the Co-op and took them out of the freezers or picked them off the shelf. If you can have anything, any time, do you really value it in the same way? I’m not sure, but for me the answer is ‘no, not so much’. As the year starts, I plant up my seeds and wait for the little shoots to appear, watching for hints of green in an ever-so-slightly obsessive manner. I coddle them along, let them spend time outside the greenhouse until they’re big enough to be allowed out all night, then plant them out… You definitely don’t get that level of anticipation from Bird’s Eye. In preparation for my normal – and quite ridiculous – level of overproduction I drew up a master list of recipes. Hm – that sounds rather more preplanned than it was in reality. When I totted up the surviving plants and realised I’d got over thirty, all of which would produce pod after pod, beans after beans after beans, I trawled through my old notes, my cuttings and part of the first section of one of the bookcases (I lost the will to live after I’d found broad beans + bacon to the power n) and wrote down some ideas. The very first were eaten raw, at the prompting of an Italian neighbour. Delicious, and I’d not tried that before. She said that as a child she’d never have dreamed of eating a raw pea though her family ate broad beans raw all the time, and that she’d been quite disconcerted to find it was the other way round in the UK. We stood by the plants and chomped on raw beans while she told me all about her early life. You don’t get that with Bird’s Eye, either. After that, I went into salads. Broad beans do have a stunning affinity with piggy products, and a spinach salad with broad beans and crispy bacon can be a real treat, despite almost every book including a version of it. Keep it simple, and it’s stunning. But I rather overdid that one last year, as I did a chorizo version, so this year I branched out and made salads with warm baby broad beans and salame finocchiona from Lidl (pretty good, not surprised it won an award last year). Goat’s cheese made another delicious companion, a change from feta. After I’d had so many sala ds that I could barely face a lettuce leaf, I branched out into risottos (yum), pastas, toppings for bruschetta – great for the bigger ones; the ones I missed because they were lurking at the back – and, star upon star, a wonderful frittata. That was an accident; it was just supposed to be an ordinary omelette but I needed to make room for another egg box and therefore used more eggs than I normally would. Served with a tomato salsa and some sauté potatoes – by that time the spuds were beginning to come on stream too – it was one of the simplest and best BB dishes I’ve ever cooked. Another absolute hit was meatballs with broad beans and lemon, from one of my favourite recipe books of all time, Jerusalem by Yotam Ottolenghi and Sami Tamimi (you can find the recipe here, as it was also published in the Guardian). I particularly loved the mixture of skinned and unskinned beans, and the lemony tang. The recipe worked beautifully; my one quibble was that the cooking time was a bit too long for my just-picked beans; when I made it again – it was that good – I added the unskinned ones at the end of cooking. Ah yes: shelling broad beans. I always, but always, unless specifically told not to, skin my broad beans unless they are the size of my little finger nail. Get fresh beans. Pan of boiling water. Broad beans out of the pods into bowl. Empty bowl into water. Boil a minute or so. Drain into sieve. Run cold water over beans; skins pucker. Easy to pop the bright green, tender, appetizing, succulent beans out of their skins, which do just fine in the compost bin. And at the end of the season, when I’m left with monster beans – well, not too monstrous, because I don’t let that happen – it’s time for a BB purée with lots of garlic. Great on sourdough – back to bruschetta – or with pitta, like a hummous. But now – nothing. Niente. Rien. Zilch. Diddly squat. Because yet again I got carried away. Yet again I have failed to freeze any; yet again I have forgotten to save some for next year’s seed. There’s an upside to that though – I can try another variety. I’m going to try a heritage bean, one with red flowers, and see how it compares to my beloved Aquadulce Claudia. Roll on next May – and now for the courgettes. I’m growing Celtic beans this year – I got the seed from a friend who works at Butser Iron Age village. They’re much later than yours, and are supposed to be left on the plant until big, and then dried and used as a staple. They’ve grown extremely well, but I haven’t tried any yet. I was reading about those in Prehistoric Cooking by Jacqui Wood – she makes preparing them sound a bit fiddly (3hrs boiling, grinding to remove skins, but that must be dried), but they do sound very similar to modern bbs, but with thicker skins. I must get hold of some and give them a try! We ate the next-to-last broad beans last night with chunky local pork chops and home grown new potatoes and mangetou. Magic meal, in a way you never quite get with shop bought produce, I agree. Will have to try eating some raw now, and try not to be envious of having so many I would need a recipe list. That only happens with courgettes! I grew Stereo this year, short but prolific pods on sturdy stems after pure white flowers, and best flavour of any I have tried so far. Stereo, eh? Since I’m having to buy seed next year, I must remember that. I’ve been looking at Crimson Flowered, which are supposed to be ‘very delicious’ but – as an archaeologist, even an ex one – I may have to experiment with Celtic Beans too, if I can lay my hands on them.